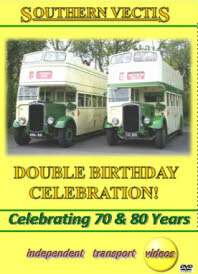 2009 is a landmark year for the bus industry on the Isle of Wight, so we would like to welcome you to this special video programme to celebrate the 70th Birthday of two Bristol K5G open top double deckers and the 80th Birthday of Southern Vectis, the main bus company on the Isle of Wight. One of the Bristol K5Gs – 602 (CDL 899) is still owned and operated by Southern Vectis making it the oldest bus still operating with it’s original owner. 703 (DDL 50) is in preservation, but has come over to the island to take part in the celebrations. The first part of this programme takes place at the ‘Island Buses Running Day’ held at the Bus Museum on the 10th May 2009. There is plenty of action on ‘The Quay’ and on the road as our cameras go out and about with the vehicles. We ride on Bristol LD 563 (SDL 268) with 703 (DDL 50) – so you can experience what it is like on both buses. Bedford OB 216 (FDL 676) is also sampled for a ride around Newport and through the bus station. Look out for the Bristol VR in Damory Coaches livery, UDL 673S as this bus was delivered new to the island in April 1978, but was later swapped with 5 of it’s running mates for 6 convertible Bristol VRs from Hants & Dorset in 1979. One of these convertibles, UFX 858S, is now preserved and attended the running day. Now you can see them operating together on service from the Museum. One of the highlights of this section of the video is the trip to Godshill with 602 and 703. We travel back on 602 and film 703 from the rear platform, fantastic views of both the countryside and of the K5G! The second part of the programme records the ‘Bustival’ event organised by Southern Vectis to celebrate with the public their 80th Birthday. The event was held at Havenstreet – home of the Isle of Wight steam railway. Again our cameras were out to film the action for you to enjoy. The first section is of the vehicles taking up position on the rally field, mostly in date order. A good chance to see the buses in detail as they are moved into place. We then go out on the road with Bristol FLF, 611 (CDL 479C) for a run down to the Bus Museum on the Quay. The run back to Havenstreet is on board birthday girl 703 (DDL 50) – just listen to the five cylinder Gardner engine! Plenty of road action is filmed at Havenstreet as well as the departure of the exhibits at the end of a most enjoyable special day. We hope you enjoyed the Celebrations as much as we enjoyed filming them!